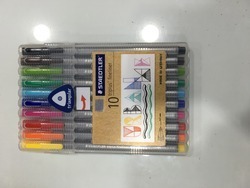 We are offering Staedtler Triplus Fineliner 10 Writing Pen. We are supplier of Staedtler Ball Pen. Award winning Staedtler Triangular Ballpoint PenSet features ergonomic triangular barrels and nonslip hold. Automatic pressure equalization prevents pen leakage on aircraft.